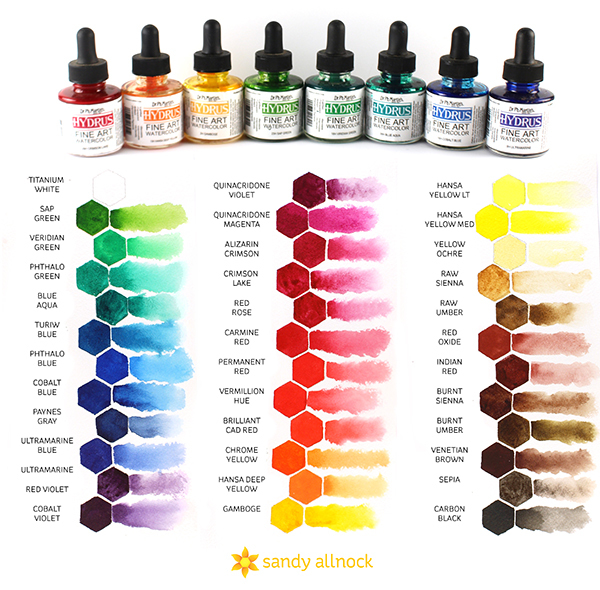 Watercolors that come in liquid form (not pans or tubes) aren’t new – but there are some new brands in the crafty world lately, and I wanted to show you some side-by-side comparisons. While it may be dissatisfying for some that I don’t have a strong “yes” or “no” on any of them, I do have some advice for you if you’re considering a purchase – scroll down for the rest of the post, as well as watching the video below (or click HERE to see it in HD on YouTube. Colors: nice range, a few strong colors, but a lot that are soft – thus no need to water down to get a light color. 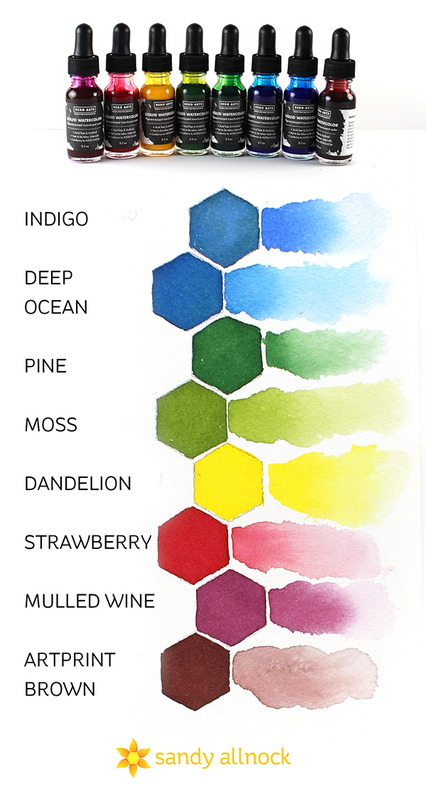 Great for introductory watercolor for sure – pick out a few colors and try your hand at watercolor. Great for mixing a wide range – try making one of THESE color charts , you’ll be impressed. I’ve had these for a few years now, and still have LOTS of color left. See set breakdown HERE. 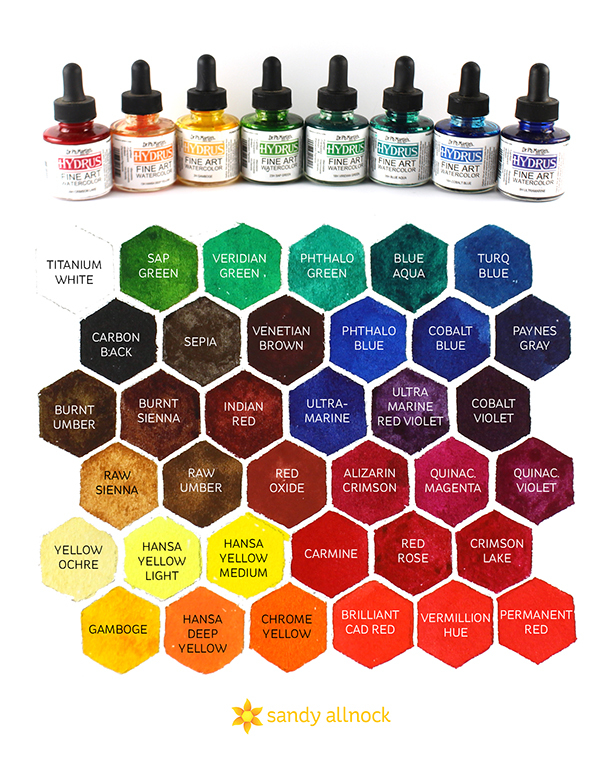 36 colors in 1-oz glass bottles. Colors: wide range, though there are lots of similar colors. Price point is lower than the other two per ounce – just over $8.50 (vs $10 or $12). But – then you then have a full oz of each color. So it’d depend on how much you plan to paint. Here’s the side by side comparison of the four cards…. FYI The Art-Classes website went belly up yesterday. Don’t worry the content is still there, your account and classes still exist. But it just looks terrible and you can’t watch classes at the moment. Vienna is standing guard over there (okay she’s actually sleeping) til I find the guy in the far east who wrote the program and can fix it somehow. He’s never around when his plugin dies. waaahhhhhh! You are such a helpful enabler! Thank you so much for doing this comparison. Very informative. Thanks for this video Sandy, great idea to make cards from your comparison samples. I need to remember that for when I tried something out again, most of the time I throw it away. Thank you Sandy. This was really helpful for me. I appreciate the time spent with the comparison. I think the cards most clearly showed differences. Thank you so much for doing this video! It really helps to have comparisons in functionality before choosing a particular product. 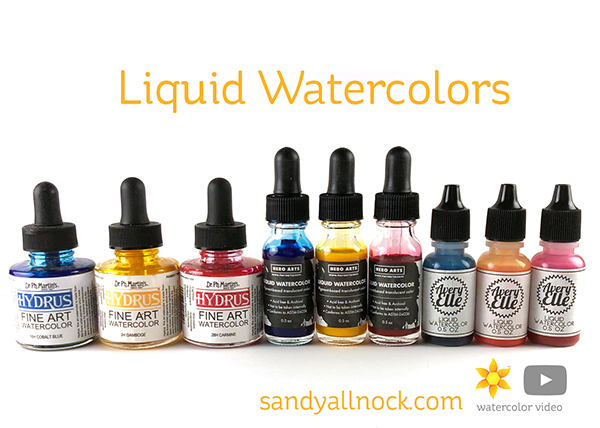 I have been thinking about liquid watercolors for some time and wasn’t sure why one would be different than another. Very useful! Thank you, Sandy. Thank you for the video. I have not used any of these and the video helped me learn the differences between them. What lovely cards made from the comparison samples. I’ll have to try this myself. TFS! A super fun way to create some quick ‘swatch’ cards, Sandy. I may have to try this with the Spectrum Noir Aqua Tints that I bought in a sale last year but haven’t used yet.